At 6,593 feet elevation, Mount LeConte is one of the Great Smoky Mountains National Park's highest peaks. When the movement to establish a national park in the Smokies was in full sway, a tent camp was erected where LeConte Lodge now stands to entertain visiting dignitaries from Washington. 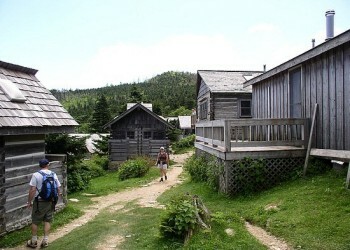 Although LeConte Lodge is now under the jurisdiction of the National Park Service, it predates the creation of the park in 1930. Jack Huff, a Gatlinburg mountaineer and founder of the rustic lodge, began building the retreat in 1926. Eight years later, Jack and Pauline Huff were married at a sunrise service at LeConte's now-famous Myrtle Point, the traditional place to watch spectacular performances of daybreak. Jack, Pauline and their family continued to operate the lodge until 1960. It is presently operated under the auspices of Stokely Hospitality Enterprises, supervised by General Managers Tim and Lisa Line. 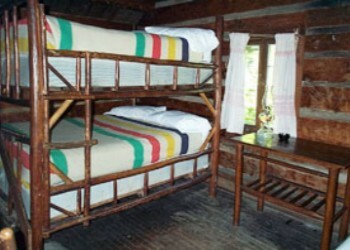 Overnight guests at LeConte Lodge are very special people. The only way to reach the facility is by taking hiking trails up and back. There are five trails to the lodge, the shortest and steepest being Alum Cave Trail at 5 1/2 miles, which a hiker in good condition can do in approximately four hours. None of these trails can be considered a stroll and you occasionally encounter ice and snow as late as May or as early as October. The other trails are Rainbow Falls and Trillium Gap, each 6.5 miles, a hike of about five hours; Bullhead at 7.2 miles and about five hours; and Boulevard, 8 miles and about 5 1/2 hours. Parking is available at the start of each trail.